A heartfelt thank you to everyone who has got involved with our project so far. What an absolutely fabulous response. We would love to have a blanket made by a national of every country in the world to represent the worldwide concern for these 60,000,000 refugees so if you know of anyone from a foreign country living anywhere in the world - then please rope them in !! We have an lady who is at home crocheting her blanket who said Quote " I am mindful that every stitch is a life" Yesterday a lady from Mumbai messaged "What can I do to help" The compassion and love felt by you all for these refugees is almost tangible. I need help from you loyal blog followers. I cooked dinner again last night, and She who must be obeyed, AKA the fussiest eater in the whole wide world was, to say the least, not impressed. My hard earned brownie points (and consequently my prize for 5points awarded) are now at risk. Two points are to be deducted for lack of effort. I've read Ellen isn't well. Chicken broth perhaps? 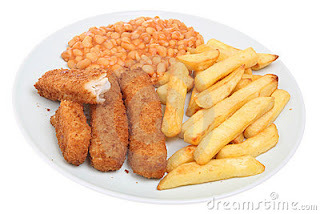 Can say this has certainly cheered me up no end , I vote for you , I love fish fingers , chips and beans. Guess what my hubby is being sent to the shops for today?